A reaction to factual stories on vaccination (Part 2). This is the second part of Amy Wallace’s (website) (twitter) tweet session following up her amazing article in Wired Magazine. It includes a number of the letters she has received in response to the article both positive and negative. As with yesterday, I have decided to consolidate this in to a blog post that is easier to read for those who, like me, find it annoying trying to read bottom to top and in such short snippets. Again the only changes I have made have been the adding of paragraphs (something not possible in 140 character tweets) and the occasional full stop, comma or space. Other than that, the section in block quotes below is directly as they came from her twitter stream. I just heard from the 280th person who has taken the time to get in touch. Yesterday, I gave you a taste of some of the bitterer missives. Those have kept coming. A reaction to factual stories on vaccination (Part 1). 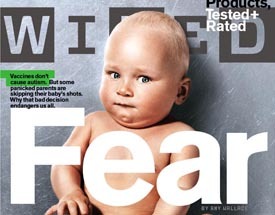 A week ago, Amy Wallace (website) (twitter) wrote an amazing piece for Wired Magazine about vaccinations, the fear mongering of the anti-vax groups, and how it puts us all in danger. If you haven’t read it yet I suggest doing so first here. Earlier today she decided to post in her twitter account about the reactions received to this story. Due to the formatting used on Twitter, I have decided to reformat her tweets and post them here in a more easily readable layout. The only changes I have made have been the adding of paragraphs (something not possible in 140 character tweets) and the occasional full stop, comma or space. Other than that, the section in block quotes below is directly as they came from her twitter stream. Antivax lies now in I.T. articles. I was reading an article at PC World about google’s new product “SideWiki“. It’s basically a program which is an extension to google’s browser toolbar which allows you to put comments in to sidewiki but not in to the article’s comments feature. This may come in handy for pages that don’t allow comments, but it’s not very good for those that do. It also has its own intelligent ranking system which I guess we’ll have to see in action first. It will be interesting to see how Sidewiki functions on controversial pages, such as those where a very vocal minority disagrees with the conventional view. Imagine the comments on pages saying that vaccinations don’t cause autism or that Barack Obama was born in Hawaii. What an beautiful day for science and medicine! Today has been a fantastic day. One of those ones that go from good to brilliant to fantastic. It started off with absolutely gorgeous weather outside, and just improved from there. It started off with one piece of news I honestly didn’t think I would ever see. New drug ‘hits melanoma’s Achilles heel’ read the headline. A drug for tumors rather than chemotherapy? Surely not. But it’s true. It is in the third stage of clinical testing stages at the moment, but it is doing extremely well, shrinking 70% of tumors which appear in over half of all melanoma cases. Some are saying it could be on shelves in a couple of years.